We talked about this on the podcast some but I wanted to hash it out here for those who don’t listen. And this post could be rendered useless as soon as this afternoon if the Mets determine that David Wright can play through his pinkie fracture. But if Wright needs a stint on the disabled list, Terry Collins should not move Daniel Murphy to third base in Wright’s absence, as he has suggested. I write this realizing that Murphy has not looked good at second in most of the season’s first six games, and that keeping him there and using Ronny Cedeno or Justin Turner at third would mean playing two infielders at relatively unfamiliar positions when simply switching them would make both more comfortable and save the team runs in the short term. And if the Mets were six games into a season in which they looked likely to compete for a division title or Wild Card berth, where they should be scrapping for wins every game, the move would make sense. But this is not that type of year, and if the team was content to open the season with Murphy at second, six games should not be enough evidence to change anyone’s mind. Collins’ job is to make the most of the guys he has, so any inclination on his part to move Murphy to third makes sense. But since Wright’s injury does not seem to be (wood knocked, fingers crossed) a long-term thing, the Mets will need to find someplace to play Murphy when Wright returns. 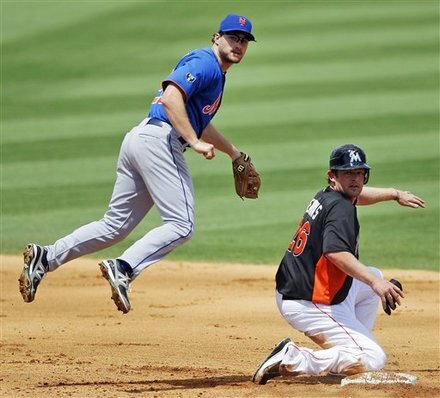 That most likely means a return to second base for Murph, only with a couple weeks away from the position and perhaps — for whatever it’s worth — some doubts about his team’s confidence in his ability to handle the position. Even if it means sacrificing some runs in the short term, the Mets should make it clear to Murphy that he’s their second baseman no matter what happens. That means keeping him there while Wright’s out and using Turner or calling up Zach Lutz to play third, understanding that while it may not be the best thing for the Mets’ chances on April 13, it is almost certainly best for their chances in August, and in 2013.